Happy Hump Dayyyyy! I’ve been trying to figure out how to share the habits I’m building on here to increase my accountable. Research shows that habits change when they are tracked and revisited daily. In order to do so I’m going to post the 5 habits I’m building each month (my Focus 5) and how I’m holding myself accountable. I’m trying to figure out a way to share my Habit Tracker as well. This month I’m focusing on simplifying my mind and space. 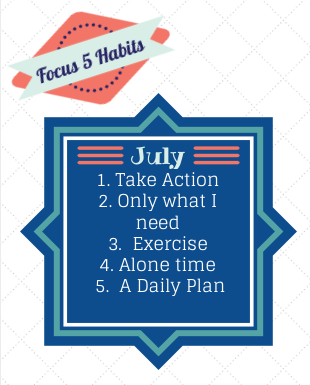 Thanks for reading my “Focus 5” Habits for July! If you have any tips that can help my journey or if you think of a way that I can help you, I would love to hear from you!